Note to self - stop touching the print bed when it's printing - or "the tale of the cursed stl"
Funny story guys... during my technically third attempt at the Art Deco box I placed something on the bed to compare sizes and it caught on one of the exposed screws and held the bed in place when it should have been moving. This of course caused the entire print to shift about an inch and ruined it at about the same spot that my first attempt was ruined. On my fourth attempt to reprint ... from the beginning... again I ran out of pla halfway through. I have the remainder of a 100 yard spool sampler that came with my printer, it is translucent white. I attempted to feed it in as the black ran out, but for some reason it just didn't fit in. Honestly I'm not sure if the rest of the white spool would even have finished the print, as I was about halfway through and there wasn't a ton of filament left. I am hoping that my 5th attempt at printing this Art Deco box from thingiverse will prove successful and I will be able to post some pictures. In the meantime I'll probably end up posting a couple snaps of what I ended up with so you can compare and contrast in the pla vs. Abs. I considered switching to abs since I have three nearly full spools of abs but I haven't been able to properly calibrate my printer to work with abs. 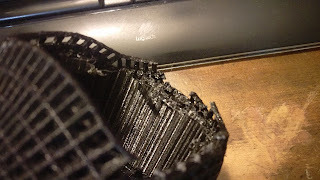 I have gotten it to work a little bit but I end up with an obscene amount of warping and or cracking in my prints. 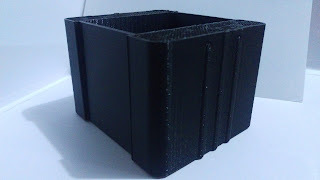 So I now have a roll of black pla in the mail from Amazon it should be here Tuesday the 1st. I also ordered some antique bronze pla it should be here about the same time. This will be great because I have had a request to print a bust of Teddy Roosevelt and I think that bronze wood accent that pretty well. But that's a future post for days to come. In the meanwhile here's a comparison picture of print in abs and the same print in pla. I have made a few attempts at getting my rPi project up and running over the last year - mostly i only have an hour or so at a time to devote to the project. The main issue I am running into is that i can't get my touch screen to register as a touchscreen.. Well it will install like a normal touch screen but when I try to calibrate it nothing happens. My ultimate goal is to have the rpi with touch screen, Octoprint and a webcam. Remote control if possible - I would love to be able to hack into it with my phone and control the printer while I am not in the room. Would make leaving the office at all a lot less stressful. The Halloween season is upon us. Now that I have my 3D printer mostly configured... It's only been two years... and I've started using pla instead of abs. 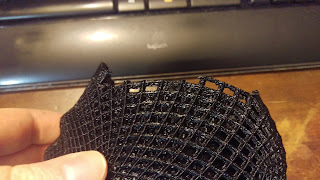 I've had many successful prints in the last week. The majority of my prints have been working towards my private hobby of board gaming. I have been on thingiverse and found a lot of pre-made board game organizers. 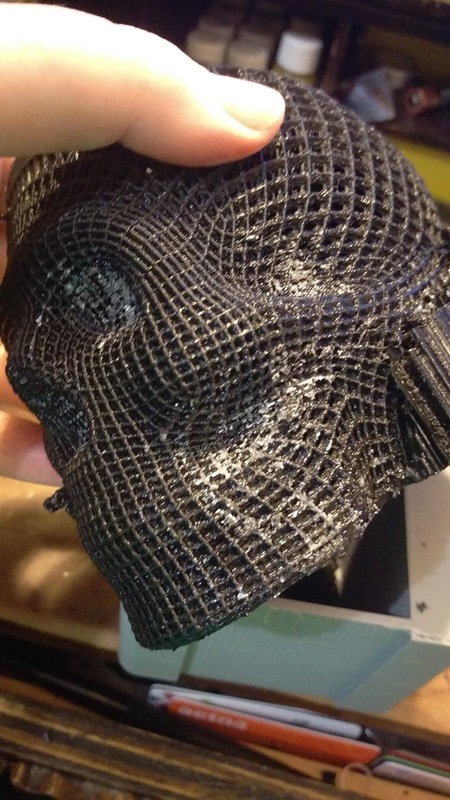 To test the endurance of my printer I have been printing back-to-back projects and experimenting with speed and support structures. The skull set at 1.9 size in cura was set to take just over 16 hours. That's a good test for my machine because I haven't done a lot of long prints. this would be a print I would have to do overnight because I work from home and I have to answer the phones occasionally. The printer is loud so I I try to print around the time I'm on the phone. So after I took lunch at work last night around 7 I set my printer to start because I don't take phone calls after that... 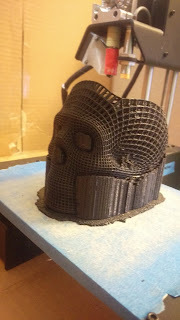 I realized a couple hours into it that it's printing supports both inside and outside of the skull. I don't really think about it's going to affect the final project . it printed into the night. I woke up this morning and it was still printing. I went upstairs made breakfast took a shower came back and it was done. I pulled it off of the bed. 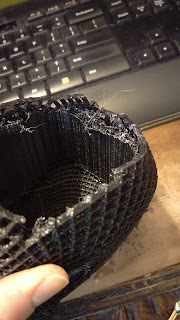 I definitely noticed that the supports printed strangely... I guess not strangely they printed as intended. However looking at the project it probably didn't need support and it's kind of fragile so getting any type of Leverage to remove the supports is going to be difficult. 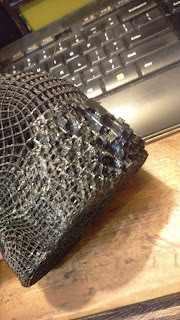 In fact removing the supports was very difficult and I ended up damaging the structure. I chipped off a couple pieces along the top. 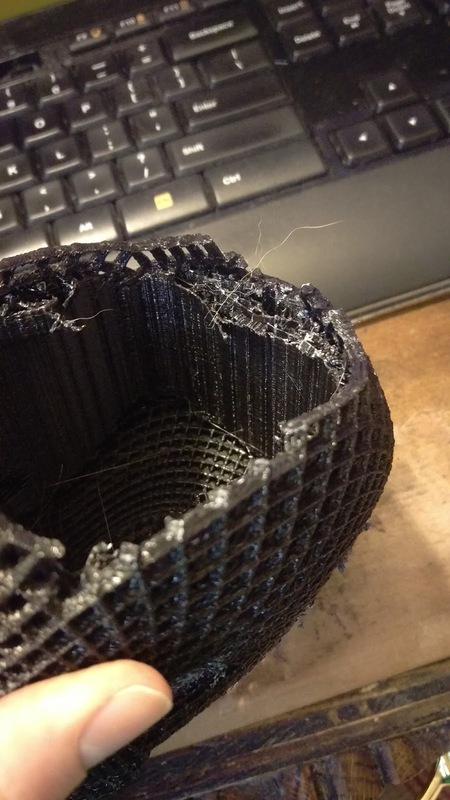 Also all of the spots where the structure was touching the object, you know all of the spots because it was supporting the object, end up getting a funky white stress mark that sometimes happens when you separate two pieces of filament. Not to mention all of the spaces in the mesh are filled with this structure filament so it ends up just being a total mess. Once I chipped off a couple of the pieces I knew it was basically a scrap project and wasted 16 hours of time.. Oh well lesson learned. 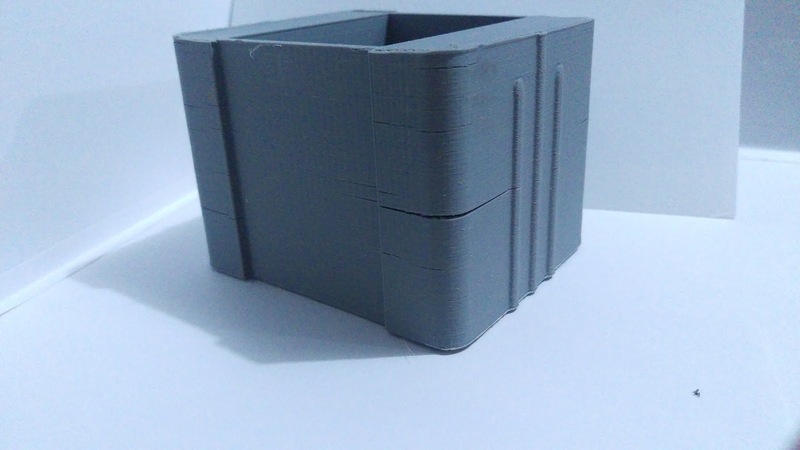 I was testing in Cura and after I turned off supports the print time went from 16 hours and change to about 8.5 hours so I decided to increase the size of the print from 1.9 to 2.5 and the time went up to 12 hours. So I'm going to try that after lunch today and let it print through the night again. 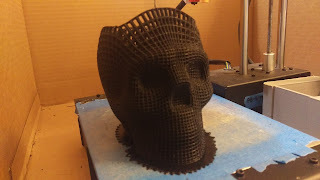 The original file for the skull it was suggested not to use supports and as long as I set the printer to go slow enough I think I should be pretty safe. 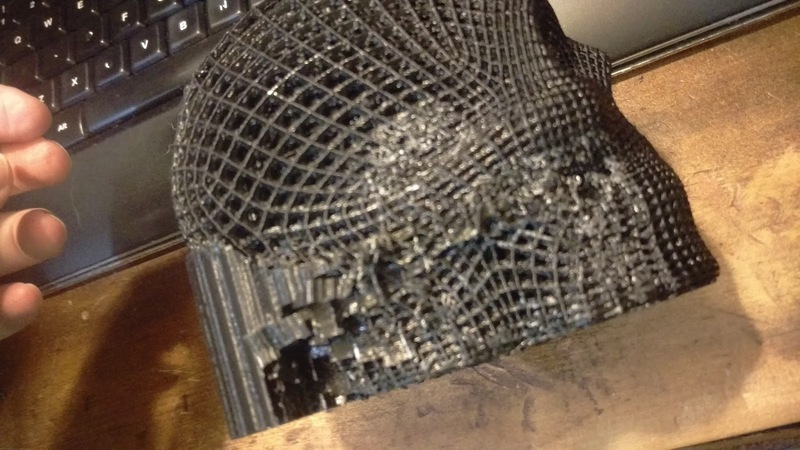 That said, here are some pictures of the "failure" it would have been perfect if not for those supports!